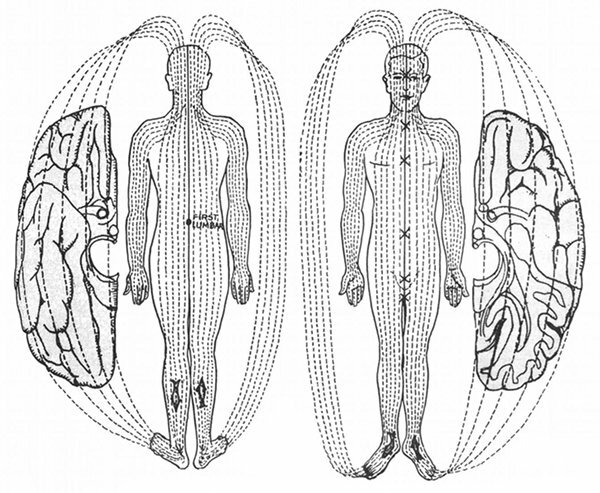 Evolutionary mind energy flows from the mind principle over the brain and the nervous system as primary energy waves. Second, as conducted impulses over insulated nerves like wires for all specific physiological function. 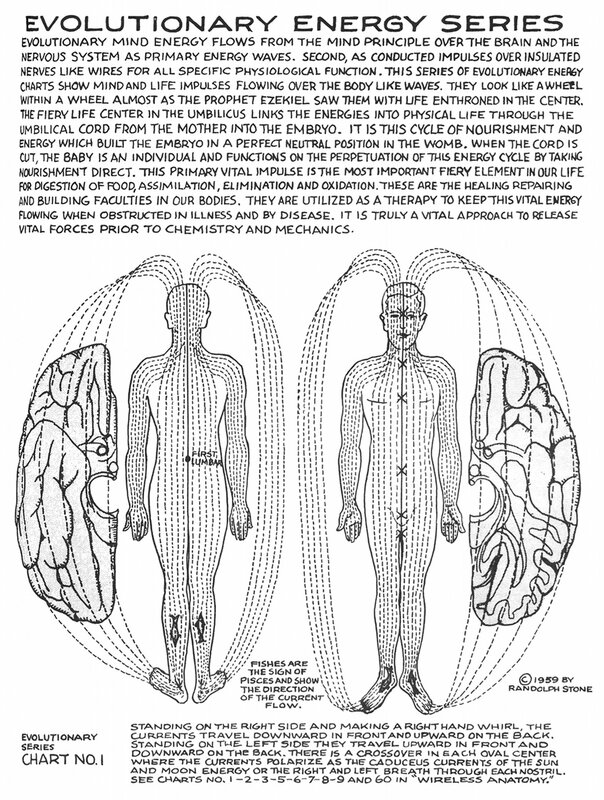 This series of evolutionary energy charts show mind and life impulses flowing over the body like waves. They look like a wheel within a wheel almost as the prophet Ezekiel saw them with life enthroned in the center. The fiery life center in the umbilicus links the energies into physical life through the umbilical cord from the mother into the embryo. It is this cycle of nourishment and energy which built the embryo in a perfect neutral position in the womb. 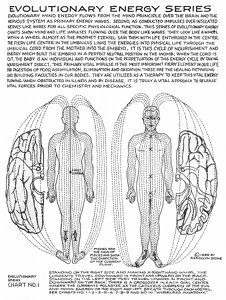 When the cord is cut, the baby is an individual and functions on the perpetuation of this energy cycle by taking nourishment direct. This primary vital impulse is the most important fiery element in our life for digestion of food, assimilation, elimination and oxidation. These are the healing repairing and building faculties in our bodies. They are utilized as a therapy to keep this vital energy flowing when obstructed in illness and by disease. It is truly a vital approach to release vital forces prior to chemistry and mechanics. Fishes are the sign of Pisces and show the direction of the current flow. Standing on the right side and making a right hand whirl, the currents travel downward in front and upward on the back. Standing on the left side they travel upward in front and downward on the back. There is a crossover in each oval center where the currents polarize as the caduceus currents of the sun and moon energy or the right and left breath through each nostril. See Charts No. 1, 2, 3, 5, 6, 7, 8, 9, and 60 in "Wireless Anatomy."